In this article we’re going to be discussing the best delay pedals for vocals that are available to purchase in 2019. 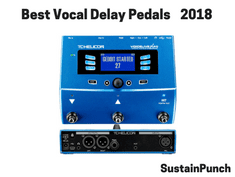 What are the best Vocal Delay Pedals in 2019? Vocal effects pedals can be split into two categories, singular function (one core effect) and multi functional units (in-built with multiple vocal effects). There are not many singular function delay pedals, instead this article will discuss the best delay pedals, which will include both singular function and multi-function vocal effects pedals. Delay is an effect in which a sound signal is repeated several milliseconds after the original signal. This effect is not to be confused with reverb, which is a slight delay, within less milliseconds, hence the audible sound, appears to be a continuation of the original sound, rather than a separate, repeated entity. Find out about our recommended Vocal Reverb Pedals here. So, with that being said, let’s get to the top 3 vocal delay pedals in 2019! Although this pedal has a multitude of functions and vocal effects available, it does not support guitar (acoustic or electric) integration and subsequently does not have any guitar effects, that the VoiceLive Play Electric & VoiceLive Play Acoustic processors do.